EDINBURGH ace Andrew Oldcorn rolled back the years to win the WINSTONgolf Senior Open in Germany, beating Englishman Paul Broadhurst at the second extra hole in a play-off. Oldcorn, who had started the final round a shot off the lead, birdied the 18th both times in the sudden-death shoot-out to earn a £44,000 pay-day. It was the 56-year-old’s first victory since landing the PGA Seniors Championship in 2011, a triumph which came a decade after he won the PGA Championship at Wentworth. 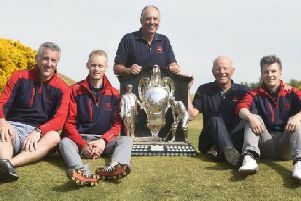 Broadhurst, winner of the Scottish Seniors at Archerfield Links on his over-50s debut last August, birdied the last two holes to set the clubhouse target of eight-under 208 in Vorbeck. Having stormed into the lead after back-to-back birdies at the 13th and 14th, Oldcorn bogeyed the 17th before digging deep to repair that damage with a closing birdie-4. The Kings Acre-attached player then holed from around 15 feet on the same green to match Broadhurst’s birdie from close range at the first extra hole, punching the air in delight as that dropped into the hole. With Broadhurst finding trouble as they played the same hole again, Oldcorn rolled an eagle attempt from the egde of the green to leave himself with a tap-in for victory. The triumph was all the more impressive due to the fact that he also beat Champions Tour No 1 Bernhard Langer, who finished a shot behind in joint-third. “I hadn’t started the season too well,” added Oldcorn. “But I had some massive encouragement this week from my wife, Kirstin, from a distance. She caddied for me in Switzerland, and knew I was playing well. Oldcorn will now turn his attention to the upcoming Senior Open at Carnoustie before heading into the Scottish Seniors Open back at Archerfield Links at the end of August as one of the title favourites.